I get a lot of questions from friends and family about whether or not a travel agent, like myself, is actually needed. I mean I get it!! 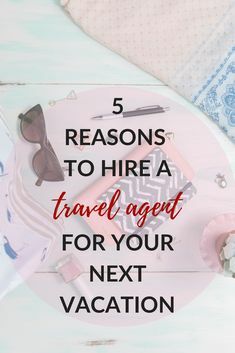 With so many resources available to you online and so many self-booking sites out there, why would you need a travel agent? I’m glad you asked! Reason 1: We Have The Knowledge! There are tens of thousands of destinations that are worth visiting, and ten of thousands of places you should avoid at all cost. Trip advisor will only take you so far. Knowing which areas are safer, what hotels are worth it, how far to venture from any one destination, tips on cuisine, tips on attractions, and the know how to get it right the first time. That’s the knowledge you pay for. Reason 2: We Have The Deals! You may think you are saving money by self-booking but in a lot of instances, you are not. Travel agents have “special” rates that are not open to the public or public site. Why? Because agencies broker on our behalf. The “Travel Agent Rate” is industry standard for the lowest. Reason 3: Planning. When working with an agent, our whole job is to think about the things you don’t think about. Having a specialist orchestrate your travel arrangements helps to assure you don’t get short changed on your vacation. Reason 4: Security. When someone else makes the arrangements, you have someone else to blame if something goes wrong, and I don’t know about you, but I for sure want someone else to scream at if my plans fall through. Because most agents will advise you to get insurance and assure that your plans are confirmed. Every agent is different with their checks and balances for themselves, but there is a system nonetheless. What that means for you, is being able to enjoy your vacation without a care in the world. And Finally…..
Go ahead, Browse through the website, read up on what you want to do! Then you can give me a call at 602-303-5386, or fill out the forms on any page and I will get you a quote within 24 Hours. Try me out on your next vacation, you won’t regret it!